More than 100 years after Lee’s surrender at Appomattox Courthouse, the Civil War continues to capture the attention of Americans in general and Hoosiers in particular. There is good reason for this. Indiana’s war-time governor, Oliver Perry Morton, was an ardent supporter of both the war and President Lincoln. Morton battled with the Indiana legislature over funds to pay for wartime expenses. These expenses were not inconsiderable given the willingness of Hoosiers to volunteer for service. In fact, Indiana contributed more soldiers per capita than any other state, providing a full 10% of the Union fighting force. In this life and death struggle, many people and institutions played vital roles. This article highlights the role of Indiana’s judiciary. In addition to the story of Morton’s efforts to obtain funds to pay war-related costs, this piece chronicles decisions about the status of public offices whose incumbents left for the army, suspension of habeas corpus, and protection of individual freedom of speech during war. 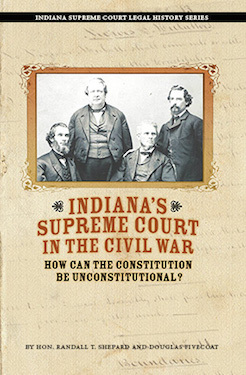 The Indiana Supreme Court is re-printing this article as a part of its Legal History Series with the hope of increasing Hoosiers’ knowledge and interest in their past. If you would like additional copies, they are available at no charge, under the directions found inside the back cover.